If you´re a long-time surfer, ask yourself this: would you become a surfer if you were a kid in 2000? “Surfers? We´re a mob of greedy, adrenalin-fuelled colonials participating in an unbelievably frustrating activity that drags out our worst instincts. 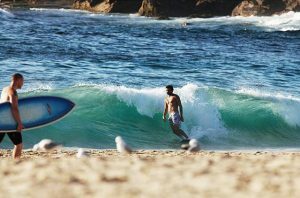 And, as for the existence of a surfing brotherhood, that disappeared long ago in any mass sense -around the same time the industry and competition bodies completed their successful lunge for mainstream and world-wide- acceptance, and overcrowding in the surf became endemic. (…) If you´re a long-time surfer, ask yourself this: would you become a surfer if you were a kid in 2000?“. “Surflariak? Adrenalina gosez bizi den jendilaje kolonial aseezina gara, geure instintu txarrenak ateratzen dituen jarduera zeharo frustragarri batean parte hartzen. Eta surflarien arteko anaitasuna aspaldi desagertu zen orokorrean, -industriak eta txapelketek surfa mundu mailan zabaltzeko jo zuten erasoa arrakastatsu gertatu zenean-, gainpopulazioa surfean gaitz endemikoa bihurtuz. (…) Aspalditik egiten baduzu surf, galdetu zeure buruari hau: surflari egingo al zinake berriz, 2000. urtean haur izango bazina?”. Galdera egin zuen Derek Rielly surflari eta kazetariak berak, ezetz erantzuten du. Behin pozoia barruraino sartuta daukanak, ordea, olatuak hartzen jarraitu behar, ezinbestean.